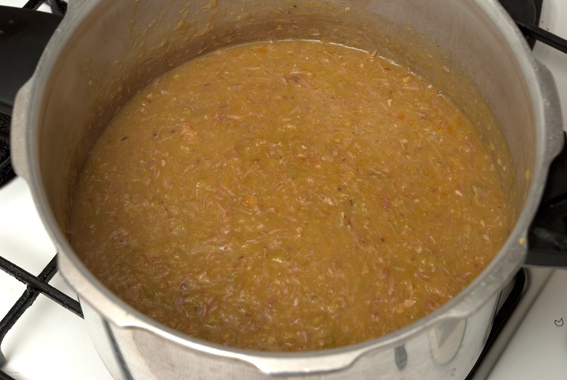 Pea soup is generally cooked or served with ham and made from dried split peas. 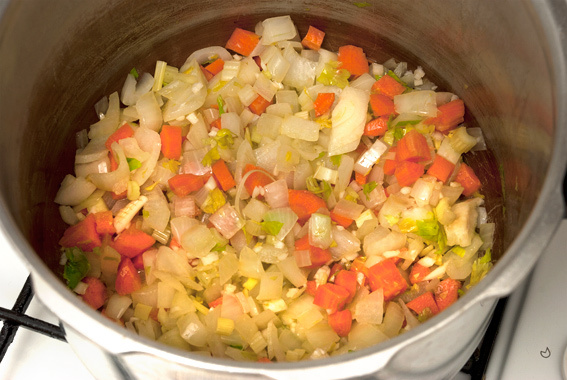 The soup’s origins go back to at least 500 B.C. Both the Greeks and Romans cultivated peas and the soup itself is mentioned in “the Birds”, by Aristophanes. 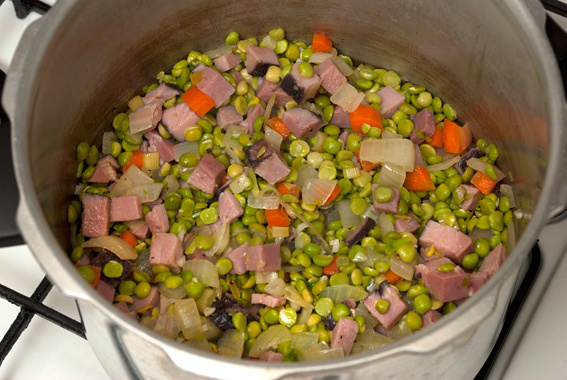 Ham and Pea Soup used to be a staple food in Britain, since it was very cheap and full of protein. 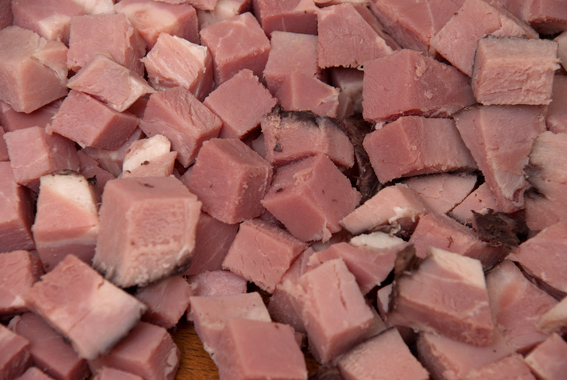 It would have been a common food for sailors, since dried peas and salt pork keep for a long time. Today it makes a very cheap and hearty winter warmer. I got the gammon knuckle from the butcher for £2.20 and 2 lb dried split peas from the Bumblebee for £1.40. Put the gammon into a large saucepan and cover it in water. Bring the pan just to boiling, discard the water and rinse the ham. Put the ham back into the cleaned pan, add a large onion, 6 pieces of garlic, 3 sticks of celery, 2 carrots, a bouquet garni and water to just cover the ham. A few black peppercorns can also be added, but do not use salt as the gammon will be salty enough already. Cook gently for 2 – 3 hours. Remove the gammon, reserve the stock, and throw away the herbs and vegetables. Since my gammon knuckle was already cooked, I cut the meat off the bone and put the bone and fat into a pressure cooker, with the same herbs and vegetables as above. I wanted about 2 pints of stock, so added a bit more than 2 pints of cold water and cooked the lot under pressure for 20 minutes. 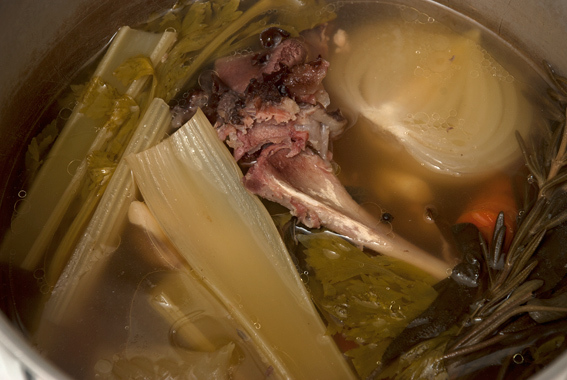 Once cooked, I strained the stock and threw away the bone, fat, herbs and vegetables. 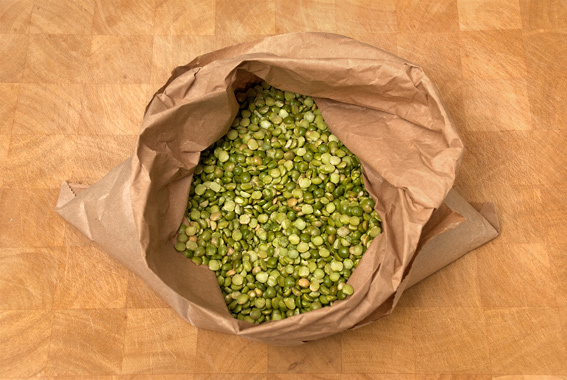 There’s no need to soak split peas, the cooking time should be about 35 minutes in a regular saucepan or 12 minutes in a pressure cooker. Pour on the 2 pints of ham stock and sprinkle on a little black pepper. Put the lid on the pressure cooker, bring to pressure and cook for about 12 minutes. The soup should look like the above picture, but if it’s not thick enough, as long as the peas taste tender, you can blend it if necessary. If you cook the soup beforehand, it will thicken noticeably when you warm it up again – you have to take care not to burn the bottom. 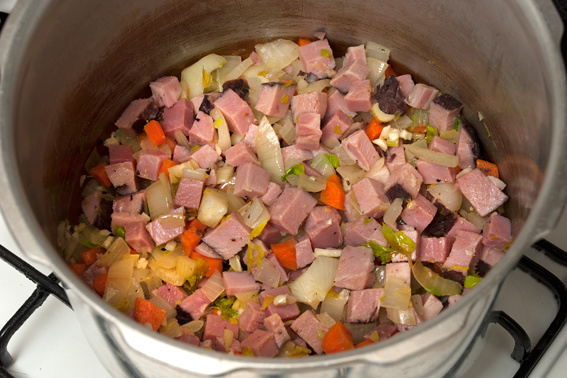 I didn’t add any salt – even if you like a lot of salt, I suggest you cook the soup and taste it before adding any, since the ham will provide a salty flavour. This entry was posted in Food, Meat, Recipes, Shopping and tagged bouquet garni, Bumblebee, butcher, gammon, ham and pea soup, ham stock, mirepoix, pea soup, pressure cooker, split peas. Bookmark the permalink. Fantastic! 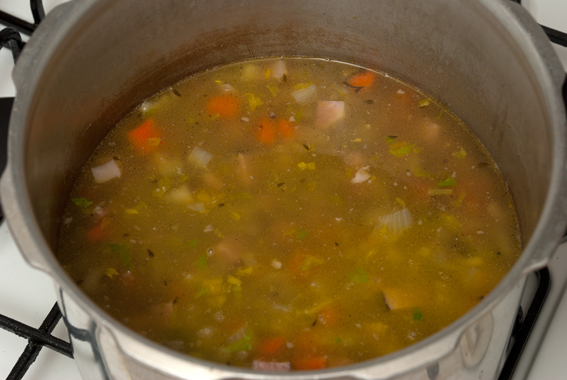 I adore this soup but haven´t had it for ages as I have never come across split peas here. Maybe one of the (very expensive) English shops would have them but I am going to scurry across to my little notice board on the fridge and and write “split peas” on the list which I compile for when people who are coming over ask me “what do you need?” Gorgeous recipe. I absolutely love split pea soup and your recipe sounds terrific! I’ll be making a batch soon — I’ve got a leg bone from the porchetta stored away in the freezer — and if it just comes close to looking as good as yours, I’ll be very happy. Excellent soup, and I wish you’d spread the word to bloggers on how to prepare pictures that open quickly, like yours. I know how to do it, but maybe they’ll listen to you! Thanks – I have seen a few this week with pictures of 2.5 mb, which is huge. Ideally they should be between 100 and 200 kb. 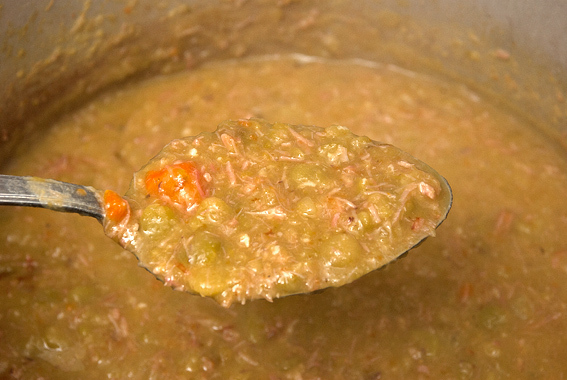 I love ham and pea soup and always make it each year with the ham bones leftover from our Christmas celebrations. 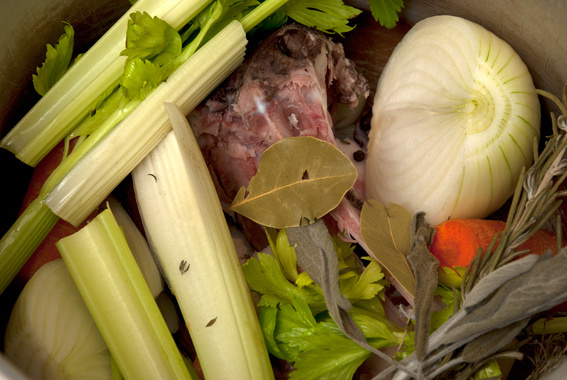 Love all your images of the process of making this soup.